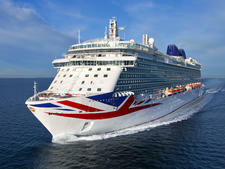 Aurora is one of the oldest ships in the P&O Cruises fleet (it was launched in 2000), and came out a much-needed £26 million refurbishment at the end of 2014 as the first to carry the new livery, featuring a contemporary version of the Union Flag on its bow, and a blue funnel. 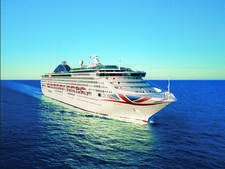 This may have disappointed a few P&O Cruises regulars, but it indicates the line's policy to combine a traditional British atmosphere with an up-to-date cruise experience. New features added in the refurbishment include the Sindhu fine dining restaurant, with an Indian-fusion menu; and the Glass House restaurant and bar, with wines selected by TV presenter Olly Smith, which replaced Cafe Bordeaux. 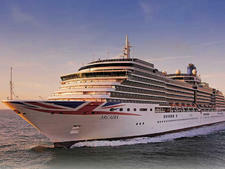 Both these restaurants are on P&O Cruises' twin sisters Azura and Ventura. The buffet restaurant and Sidewalk Cafe were also completely refurbished and include a new Costa Coffee and Grab & Go counter and flexible "Freedom Dining" in the Medina Restaurant, plus more tables for two; and Marco Pierre White dishes on gala evenings. The refit has transformed the public rooms and they are now bright and attractive, with exceptionally comfortable seating. But some of the rooms and corridors are distinctly chilly, and there is evidence of minor wear and tear in places, despite the refurbishment which is inevitable with a ship that is now approaching 20 years old. Aurora is a family-friendly ship and has extensive kids' facilities, so expect a large proportion of children during holiday times. However, outside of school holidays the ship reverts to its traditional demographic of 50-something and older Brits. 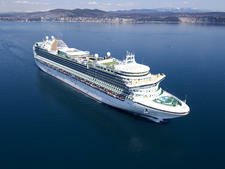 There are normally two formal nights per seven-night cruise. Black tie for men predominates, although lounge suit and tie are acceptable. Low key evening and cocktail dresses are usual for the women. Those who don't want to dress up can use the cafeteria, but formal attire is required in the main restaurants. The other nights are either semiformal or smart casual, according to the ship's itinerary. Shorts and jeans aren't welcome in the restaurants. Editor's note: From May 2019, auto-gratuities will be removed. A £7 per person per day (for over 12s) is automatically added to your onboard account, and further tipping is optional. Note: It is not possible to pre-pay gratuities prior to boarding the ship, however pre-purchased onboard credit can be used to cover the service charge. With 3,100 passengers and P&O's traditional line-up of full dress codes, afternoon tea, deck games and ballroom dancing, Azura is one of P&O's largest and most popular ships. 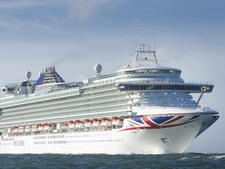 Ventura is the joint second-largest ship in the P&O Cruises' fleet, with the largest kids club. In November 2016, Oriana underwent a refurbishment which included a complete makeover of cabins, restaurants, bars, entertainment areas and public spaces. The 2,016-passenger Oceana might not be the largest or fanciest in P&O's fleet, but its contemporary vibe is attractive to both new and veteran cruisers. Arcadia is unique in the sense that it's a strictly adults-only cruise ship, catering to mature British couples and friend groups. 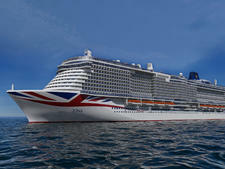 Britannia was named by HM The Queen on March 10, 2015, in a glittering ceremony in Southampton. 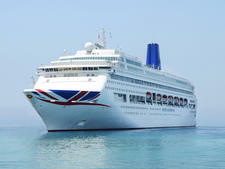 The Queen last named a P&O Cruises' ship almost 20 years ago -- the 1,800-passenger Oriana -- then the largest ship in the fleet, which ushered in a new era of modern UK cruising. P&O Cruises newest ship, Iona, launches in May 2020 and will be the biggest ship built for the U.K. market, weighing 180,000 tons and carrying 5,200 passengers.